Excel is trying to tell me something about pies and drinkies. I’m not sure what exactly Excel is trying to tell me. I like green*, gradual shading, tea, ale and pie so I’ll immerse myself in the visual aesthetic of the pie chart experience and understanding might emerge with time and fermentation. Well done Excel, you surely must be right. Scatttered reasons for why I’m single. * thanks to Raymond for pointing out the essentialness of the green-shaded-3D-pie. This scribble was published on Friday, September 7th, 2007. You can follow any banter on this scribble with the RSS 2.0 feed. You can leave a response, or trackback from your own site. The green, gradual shading is making it hard to tell which beverage is which, sort of like if you’d poured them all into a glass at the same time. 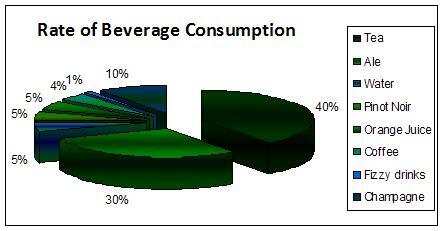 Too bad Excel doesn’t allow you to make beverage choice charts like a pousse cafe. That would be cool.